1) What is The Longest Day? The Longest Day is a sunrise-to-sunset event to raise funds to fuel the care, support and research efforts of the Alzheimer’s Association. Held on the summer solstice, the longest day of the year, this event challenges participants to push their limits and complete approximately 16 hours of a consecutive activity – such as playing bridge. It’s one day to honor the strength, heart and endurance displayed by people with Alzheimer’s and their caregivers every day. 2) When is The Longest Day? This year, the ACBL will allow clubs to choose their Longest Day during the week of the Summer Solstice, June 16 – 23, 2019. 3) How long is The Longest Day? From sunrise to sunset on the day each club chooses during the week of June 16 – 23, 2019. 4) How can my bridge club participate? The first step in participation is registration. For participants in the United States and Canada, visit alz.org/acbl and follow the prompts to officially register with the Alzheimer’s Association. Use code “ACBL” for free registration. Next, choose your Longest Day between June 16-23, 2019, and schedule as many Alzheimer’s games as desired on the ACBL website. All Alzheimer’s games are eligible for upgraded masterpoints, 63.6% sectional-rated black. See the ACBLscore instructions for more information. In addition to bridge play, we ask clubs and players to fundraise for the cause. When you register, you will receive a guide with information to assist you with fundraising and operations of your The Longest Day event. Clubs in Canada will need to register with the Canadian Bridge Federation, cbf.ca. 5) What if my club doesn’t have a sanction or a location for Thursday, June 21? We have relaxed our sanction rules during the week of June 16 – 23, 2019 to allow all ACBL clubs to participate. You can choose your Longest Day during that week and run Alzheimer’s games all day. You do not need a special sanction for Alzheimer’s games. We are also allowing your team to play bridge in any location. Clubs with multi-site sanctions and wanting to hold games at only ONE location for The Longest Day can choose any one day between June 16-23, 2019 to participate. However, clubs holding multi-site sanctions and wanting to hold games at MULTIPLE locations for The Longest Day can only participate at each location on the day of sanction on file with the ACBL. Each location can only have one Longest Day. Instructions for setting up games in ACBLscore for The Longest Day can be found here. 6) Are we required to run games from sunrise to sunset? Ideally, we would like all clubs to play marathon bridge for the duration of The Longest Day, but we realize that may not be possible. Just as each bridge club is their own fundraising team, so is the ACBL. 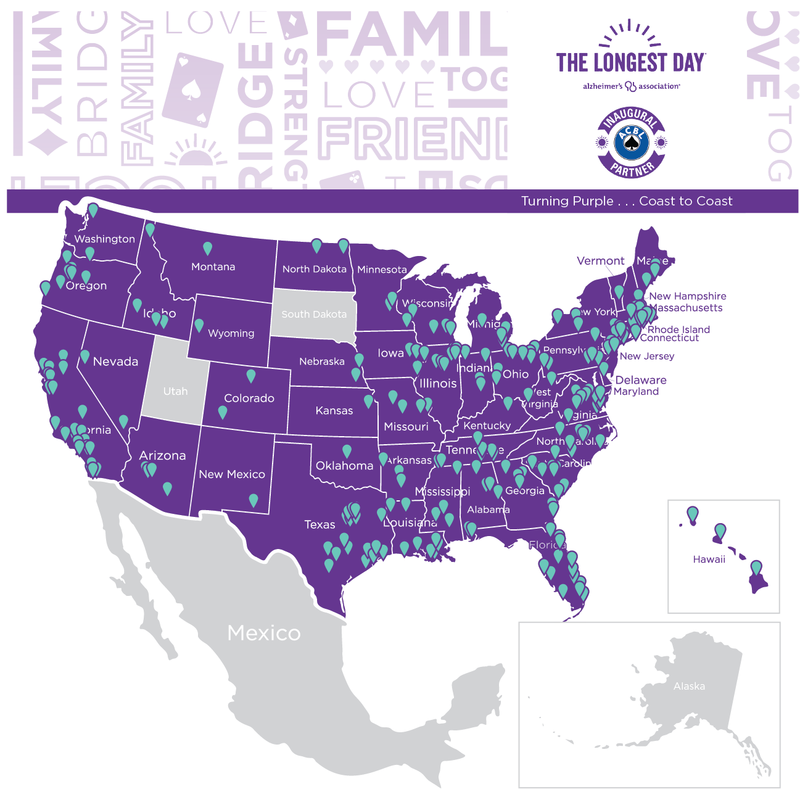 Any amount of time you play on The Longest Day while raising funds for the Alzheimer’s Association will help Team ACBL achieve its goal of having bridge played from sunrise to sunset. If you can’t play bridge the duration of event, there are other ways to still actively participate. Your fundraising team could play bridge online when not at the club, hold bridge exhibitions around your city or conduct free bridge lessons for the community. 7) Do I have to raise money to participate in the event? ACBL’s goal is for each club fundraising team to raise a minimum of $100/hour of activity; however, you can input your own fundraising goal when you register. We encourage you to challenge yourself and set a goal that represents the commitment that you are making. 8) What if I can’t raise the suggested minimum? What kind of support will you provide? This event does include a fundraising component. Every dollar you raise goes to support the Alzheimer’s Association. We know that the idea of asking people for money can be intimidating, especially if it’s not something you’ve done before. Most people are pleasantly surprised at the response they receive when asking friends and family for donations. If you use the tools provided, your goal should be achievable. If you do fall short of the goal, your team will not be billed or charged. 9) Where does the money go? For The Longest Day, funds raised go to further the care, support and research efforts of the Alzheimer’s Association. 10) How does the Alzheimer’s Association receive the money our club raises? Do donors receive a receipt? The ACBL will send in your sanction fees collected from Alzheimer’s games played during the week of June 16 – 23, 2019 directly to the Alzheimer’s Association. For the other funds raised by your club and players, there are two different options for submitting directly to supporting charity organizations. The first and best option is to have donors visit your fundraising page on The Longest Day. From here, there is an option to “donate,” and a confirmation of donation will be automatically generated. If you would prefer to mail donations, please use the donation form included in the Team Captain kit or download another from the ACBL Resource Center. If you are sending in multiple checks via mail, a receipt will be sent to the name and address of each donor as it appears on their check. 11) Do players receive upgraded masterpoints? Games played during the week of June 16 – 23, 2019 in support of The Longest Day receive upgraded masterpoints – 63.6% sectional-rated black, as long as you are not within a 25-mile radius of a Regional or Sectional tournament. 12) What are the sanction fees for games played on The Longest Day? Clubs can hold as many special fund games as desired between 12:00 a.m. and 11:59 p.m. on the Longest Day they choose between June 16 – 23, 2019. There are two options for the type of special game you can run on your Longest Day. Both options receive full masterpoint awards. If you choose to run a regular game (18+ boards), the sanction fee per table for a game is $5.00 ($1.00 table fee + $1.00 per player). This is just like a special game typically run at the club. The second choice is to run shorter games (12-17 boards) maximizing the number of marathon games you can hold on The Longest Day. If you select the shorter game option, the sanction fee per table for a game is $3.58 ($.58 table fee + $.75 per player). All sanction fees should be included on your regular monthly report. Once collected, sanction fees from U.S. clubs will be donated to the Alzheimer’s Association and fees collected in Canada will be donated to the Alzheimer Society Canada. ACBL donates 100% of the table and sanction fees collected on The Longest Day to the Alzheimer’s Association. 13) What if I want to hold charity games for The Longest Day on a date other than June 21? Charity Club Championship Game— This game will use your allocated one fund/foundation game per month for the scheduled session. DBADD the game and specify the name of the local charity as Alzheimer’s Association. Masterpoint Awards Chart can be found here. Club Championship Game— This game will use the club championship game your club is allocated once per quarter per sanctioned session.  Masterpoint Awards Chart can be found here. Membership Game— This game will use the membership game your club is allocated once per year per sanctioned session. Only Life Members and paid ACBL members are allowed to play in this game. Masterpoint Awards Chart can be found here. ACBLscore instructions are located here. Regular club game fees will be included with your club’s month end report. The club is responsible for sending any additional fees collected directly to the Alzheimer’s Association for all games listed above. 14) My club has a multi-site sanction. Can I run Alzheimer’s games at all locations? Clubs with multi-site sanctions and wanting to hold games at only ONE location for The Longest Day can choose any one day between June 16-23, 2019 to participate. However, clubs holding multi-site sanctions and wanting to hold games at MULTIPLE locations for The Longest Day can only participate at each location on the day of sanction on file with the ACBL. Each location can only have one Longest Day.